The causes of the war between Iraq and Iran in the 80's are historic and deeply rooted in concerns over internal security, territorial boundaries, and achieveing control over regional politics. 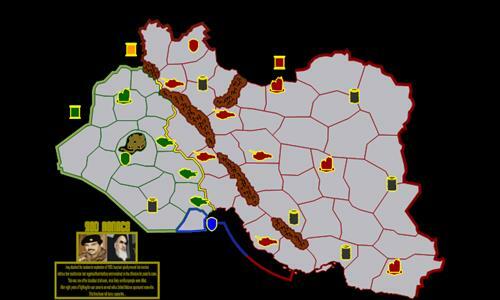 The map was made to fit a very specific scenario which will allow players to step into the shoes of either Saddam Hussein or Ali Khamenei and lead their nation to victory or ruins. The game's purpose is to introduce a very unique gameplay, which will require lot's of planning, and include the importance of oil during this conflict. Review by Nathan on 8/14/2014. Interesting map. I like the historical annotation at the bottom-left. I definitely recommend creating some scenarios/distributions, including some "what-ifs". Review by Dalas120 on 12/8/2014. Great map and template! The map creator (and template, the two were made specifically for eachother) spent tons of time balancing and fine-tuning everything for a very enjoyable game. AIs add additional tactical options and give places to expand. I personally have only played as Iraq, but Iran is very enjoyable as well, though it requires slightly more skill. I lasted 25 turns vs the map-maker; see how well you do! Review by M. Poireau on 9/16/2015. Good map. I'm not sure how the scenario is supposed to work, however. It's supposed to be "balanced", but I'm not sure it is for the "little guys". Is it supposed to be a team game? Review by brad on 12/3/2014. Review by Nuclear Biscuit on 8/16/2014. Review by DanWL on 8/16/2014. Good map and good scenario settings. Review by DESTRUCTINATION on 8/31/2014. I kinda liked this map. Probably best for small games with 3-4 people.